Sadly announces the death of a dear family member, Master Mary Davis Cates. Mary Davis Cates passed away on May 16, 2006. Master Mary was one of the first US Cuong Nhu students at University of Florida when Ngo Dong, Ph.d founded the school there. She has been an important part of the Cuong Nhu family for over 35 years and achieved her Shichidan in 1998. We feel extremely fortunate to have had Master Mary as a big part of our lives. She had given so much to our style and graced everything with her elegance and thoughtfulness. Words cannot express the depth of this loss. Not only was she a great teacher and leader, but she also was a loyal and good friend. She had Cuong Nhu in her heart and always tried to live by Cuong Nhu Code of Ethics. On behalf of the Cuong Nhu family, we offer our condolences to Master Ernie Cates and family. Master Cates requested that a memorial service to celebrate Master Mary Davis life will be conducted at the Cuong Nhu International Training Camp in Gainesville Florida at the University Campus next week in place of a funeral service. Her husband Ernie Cates is the creator of Neko-ryu Goshin Jitsu, holding a tenth degree black belt (Ju Dan). Professor Cates was awarded the title of Professor from the U.S. Judo Association of which he currently holds an eighth degree black belt (Hachi Dan) in Kodokan Judo. He also holds a seventh degree black belt in Taiho JuJutsu (Police Tactics) and a seventh degree black belt in Goshin Jitsu (Self Defense Tactics). 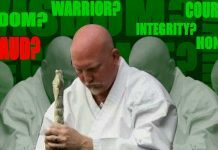 Professor Cates was recognized by the World Head of Family Sokeship Council as Soke (or founder and head of family) for the Neko-ryu system making the system a recognized and validated martial art. Professor Cates has been inducted into the American-Okinawan Karate Association Hall of Fame; the International Association of Martial Arts Hall of Fame and the World Head of Family Sokeship Council International Hall of Fame. Professor Cates is retired from the U.S. Marine Corps where he achieved the rank of Captain. 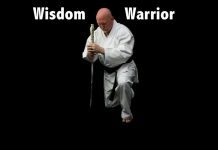 During his career in the Marines, he was the 1956 Okinawa Judo Champion, the overall All Marine Corps Judo Champion from 1959 to 1963 and the All Marine Corps Judo Champion from 1959 to 1965 in his weight division. He was also twice the USMC Inter-service Grand Champion in Judo. Professor Cates is currently the only American ever to be awarded the Japanese Ambassador’s Cup in Judo which he received in 1962. Professor Cates has taught over half a million U.S. Marines in hand-to-hand combat. Professor Cates has served as Captain of the Eastern United States USMC Team Championships and the Southern U.S. AAU. Professor Cates also trained Dan Severn for the Ultimate Fighting Championships. During a military tour of Vietnam from 1965 to 1967, at the University of Hue he trained Ngo Dong in Judo, and helped Professor Dong add Judo techniques to the art of Cuong Nhu. The late Ngo Dong, Ph.d was the founder of the martial arts system Cuong Nhu. 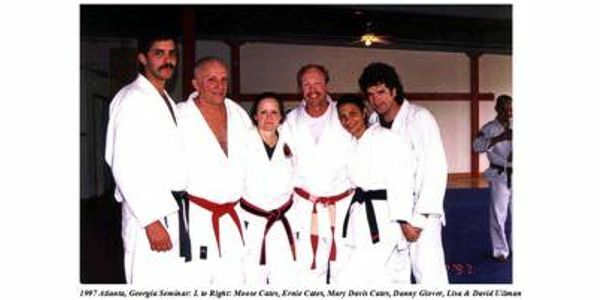 Mary Davis-Cates was the wife of Ernie Cates, Marine Corps Judo instructor to professor Ronald Duncan. She was a member of Cuong Nhu Oriental Martial Arts for over 35 years. During this time she excelled to the highest possible rank in this organization. 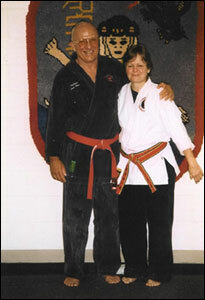 Mary received notice of her promotion to 8th degree Black Belt prior to passing away May 16, 2006. This promotion made Mary the highest ranking black belt within this organization. It was with great honor and respect that she received this promotion and she was overjoyed. Throughout the past 35 years, Mary spent countless hours training, competing and traveling across the U.S. to share her experience and gain more knowledge of Cuong Nhu and many other forms of Martial Art. It is not unusual to hear her peers talk about the profound affect her teaching, her attitude and her strive to uphold the ethics and principals of Cuong Nhu had on them. Many women and men alike have called her their sensei, mentor and friend. Mary’s life was not without her own trials. Several years ago Mary underwent numerous treatments for cancer, followed by open heart surgery, a battle with staff infection, and financial difficulty. She didn’t, however, give up her hope or desire to continue to work on her personal growth and though she admitted to having difficulty reaching out to her friends for assistance, her friends didn’t hesitate to reach out to her. With this in mind, we, along with many others, have formed a scholarship foundation in her name. The purpose of this foundation is to enable those women that show the ability and desire to continue their Martial Arts training yet may be less able to afford to do so. It will focus on but not be limited to those women within the Martial Arts community that desire to attend the annual Cuong Nhu Training Camp held each year during the Memorial Day Weekend. The training camp was always one of Mary’s favorite events. She not only participated as a student but dedicated many hours as an instructor. Her passion lay within the walls of each and every Dojo she visited. Her joy would be to see many other women like herself have the chance to participate as well. We would like to see Mary’s desire to help others and her dream to make a difference come true. Please support us in this effort. Burlington, NC, USA – Mary Aida Davis Cates, 55, of 706 S. Sellars Mill Rd. died Suddenly of an Intra-cerebral Aneurysm Tuesday, May 16, 2006 at UNC Chapel Hill, NC. Mary was born in Gainesville, Florida and graduated with a BA in Graphic Arts from the University of Florida. Mary enjoyed graphic arts, calligraphy, gardening and spending time with her many pets. Mary is survived by her husband, Professor Ernest H. Cates of Burlington, NC, two step sons, Ernie “Moose” Cates of Pittsboro, NC, Erik Cates of Burlington, NC and two step-daughters, Punchie Hopp of Big Fork, MT and Dawn Stephens of Lutz, FL, 6 grandchildren, Jamie, Michael, Heather, Ernie, Josh and Autumn, and 3 great-grandsons, Will, Mason and Jordan, her mother Jeanette Davis of Gainesville, FL, two brothers, Roland Davis and Tommy Davis both of Gainesville, FL and one sister, Pam Davis of Colorado Springs, Colorado. A memorial will be held on Saturday May 20, 2006 from 1 to 3 pm at the Burlington Martial Arts Center 2139 N Church St. # A, Burlington, NC and A Celebration of her life will be held during the Annual International Cuong Nhu Training Camp at the University of Florida Campus, Gainesville Florida on Friday, May 26, 2006. In Lieu of Flowers, donations can be made to: the Mary Davis Cates Scholarship Foundation, P.O. Box 585, Burlington, NC 27215. The Cates’ family would like to thank the Staff and Team of Physicians at the Neurosurgical ICU of UNC Chapel Hill for their excellent care. Lowe Funeral Home and Crematory, Inc. is serving the Cates Family.